I got up super early (which is just regular early for regular people, but super early for the vampire girl—a.k.a. moi), went to the university where my husband teaches, and filmed a news show for the Virginia Department of Health’s Bright Futures project. 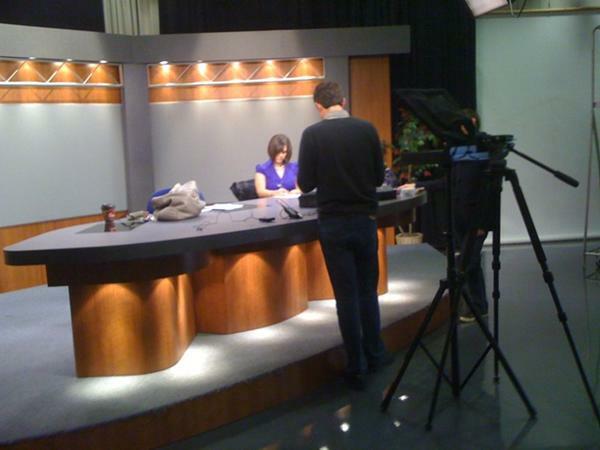 And when I walked in the studio, WHSV’s (that’s Harrisonburg’s news channel) Yuna Lee was there—playing my co-anchor! So cool! Anyway, we spent about three hours filming, and it was fun to play newscaster. After that, I spent the rest of the afternoon working my husband’s office and meeting some of his students. I’m still not used to people calling him Dr. Schultz—hee! It’s always just really fun to see how students interact with him. So . . . I was going to do this week’s blogosphere post before I turned in for the night, but I’m too wiped. Hoping to sneak it in tomorrow afternoon after we do our power shopping (being that there isn’t a ton of shopping in the ‘burg, we’ll be traveling about two hours away to an awesome mall in Short Pump, Va., to finish out our Christmas list). You get to do the coolest stuff, Ricki! Love the purple top. And you’re perfect for TV. I totally think you should reconsider General Hospital. Dude — sign me up!